Second Lieutenant Tommy Hart, a navigator whose B-25 was shot out of the sky in 1942, is burdened with guilt as the only surviving member of his crew. Now he is just another POW at the fiercely guarded Stalag Luft 13 in Bavaria. Then routine comes to a halt with the arrival of a new prisoner: First Lieutenant Lincoln Scott, an African American Tuskegee airman who instantly becomes the target of contempt from his fellow soldiers. When a prisoner is brutally murdered, and all the blood-soaked evidence points to Scott, Hart is tapped to defend the soldier. In a trial rife with racial tension and raw conflict, where the lines between ally and enemy blur, there are those with their own secret motives, and a burning passion for a rush to judgment, no matter what the cost. 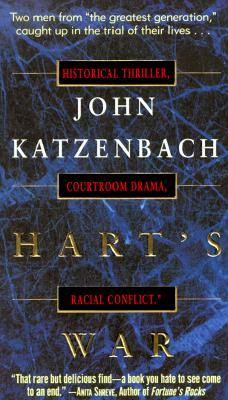 John Katzenbach has written six previous novels: the Edgar Award-nominated In the Heat of the Summer, which was adapted for the screen as The Mean Season; the New York Times bestseller The Traveler; Day of Reckoning; Just Cause, which was also made into a movie; The Shadow Man (another Edgar nominee); and State of Mind. Mr. Katzenbach has been a criminal court reporter for The Miami Herald and Miami News and a featured writer for the Herald?s Tropic magazine. He lives in western Massachusetts. "Katzenbach weaves a complex and intriguing mystery while at the same time illuminating a piece of history. I found myself caught in its grip within the first few pages." "THIS IS A WONDERFUL NOVEL. IT DESERVES READING . . . THE CHARACTERS . . . LEAP OFF THE PAGES." "FASCINATING AND POWERFUL . . . AS BOTH A WAR NOVEL AND A LEGAL THRILLER, HART?S WAR IS A COMPELLING READ." "SCENES OF CONSIDERABLE POWER . . . KATZENBACH?S BEST."